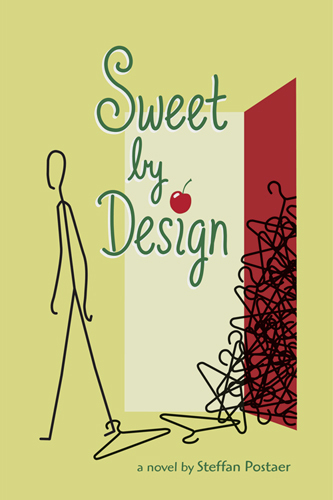 This is my second entry for author Steffan Postaer's contest to come up with a cover design for his latest novel "Sweet by Design" which can be read in its entirety here. There are about sixty entries, many of which are very clever. While I usually don't take part in "crowdsourcing" artwork, I thought the idea of rolling out a book by posting it online chapter by chapter was fun and different and I enjoyed the collaborative nature of the contest. The book is a mostly light hearted "road trip" story, about a Chicago interior designer who, along with his faux fianceé, makes a visit to GreenBay, WI for his father's 80th birthday party. It's a fun story with good characters. Steffan himself has just announced on his blog that he's leaving his post as Chairman & Chief Creative Officer of Euro RSCG Chicago. Best of luck to him in his next venture.